Licensed in General Pest, Wildlife, Fumigation, Right of Way, Termite Control. Capitol Pest’s mission, since 1936, has been to be the Washington, DC area’s most professional, dependable, trustworthy, and best-trained pest control company. It is our intention to deliver to the community a service for which there is value and that we are all proud of. We will provide these services promptly, efficiently, courteously and safely. Additionally it is our goal to promote the benefits of professional pest control service by other companies as well and to serve as leaders in our industry. After three months of going insane over unsuccessful bed bug and carpet beetle treatments from two companies, Capitol Pest came to our rescue a day after we called them. Since Capitol Pest’s treatment, we haven’t been bit nor have we seen any of these nasty bugs. We used a bed bug sniffing dog that the company suggested to locate bed bugs in our house. Their technicians have been prompt, friendly, work hard, and care about the safety of their customers. If a Capitol Pest person can’t answer questions over the phone, s/he soon calls back with the answer. Capitol Pest employees entomologists who identify bugs and provide information about insects. They have always given us good advise. 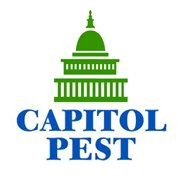 Capitol Pest include bed bug and carpet beetle extermination in their yearly plan, whereas other companies charge an extra fee to get rid of these particular bugs. I highly recommend this company. Not only did they get rid of the horrific insects, but all the employees seem knowledgeable, and courteous. Most of all, they seem to care about the emotional well being of their customers. You’re like a five star Michelin restaurant of pest control. I've found Capitol Pest to be extremely responsive and helpful. Their service people have been great. Very glad I discovered this company. They are knowledgeable, skilled, and customer-service oriented. Will use again. Highly recommended. The technician was very professional and courteous throughout the process of treating the pest in my home. I would recommend your company to anyone who needs such services. Very pleased with service I have received so far. Keep up the good work! All of our experiences with Capital Pest have helped us defeat our pest issues. They respond in a timely manner to calls and questions which means so much when pests are an issue. In addition, the technicians are extremely helpful, knowledgeable and pleasant professional folks. The terrible experience we had with our former well know company has been eclipsed and for that we are also very grateful. GREAT STAFF. PROMPT AND EFFECTIVE SERVICE. Capitol Pest Control technicians are always on time, and are very responsible. They are very professional, efficient, and the products they use are very effective! This is a wonderful company. They got rid of my mice problem when others couldn’t. They are always very responsive to concerns and timely and professional in their service calls. They really know what they are doing. I honestly couldn’t ask for anything more. good response in treating outdoor carpenter bees and indoor ants; friendly staff. I believe your representative made a good inspection of our home. Hopefully, we will never have pests in our home. L.A. Brazell. For 40 years we have been with Capitol Pest Service. Yearly inspection is key to peace of mind. Nicole is amazing she always answers the phone and my questions with a smile. Yes I'm pleased w the service and quick response time. Also the phone contact and technicians are professional and helpful. Stanley is experienced and did a great job. I've been very happy with how the professional and personal attention as been with Capital Pest. I was referred by and friend and will refer Capital Pest in the future. Gerrardo has been the best. RESPONSE TIME, OBVIOUS AGGRESSIVE ACTION, AND A HIGH LEVEL OF PATIENCE EXPLAINING REALITY TO US IS APPRECIATED...FK. Highly recommend Capitol Pest. Extremely knowledgeable and professional. I have used other pest control companies in the past and none would compare with the service that was provided by Capitol. I spent a lot of time doing research and Capitol by far has the best resources and experience to handle any pest problems. Capitol Pest has taken care of our home for over 25 years. We are most pleased with their service. The company is prompt and vigilant in its follow-up visits. It's too early to rate on the success on addressing our pest problem, but the plan of action seems reasonable. The inspector was courteous, on time, pleasant and thoroughly inspected my home. Quick, efficient and keeps to their schedule. Great, knowledgable, dependable, and — most importantly — effective service! We need a paper report. thank you LA. Excellent work. On time. Leave everything clean after the work is finish. Please send back. I found new holes in yard. Thx. Did a wonderful job....as all ways. They are very good and recommend using them.